I may not have planned my series of exotic operas earlier this summer, but I did plan to juxtapose Offenbach with Wagner. 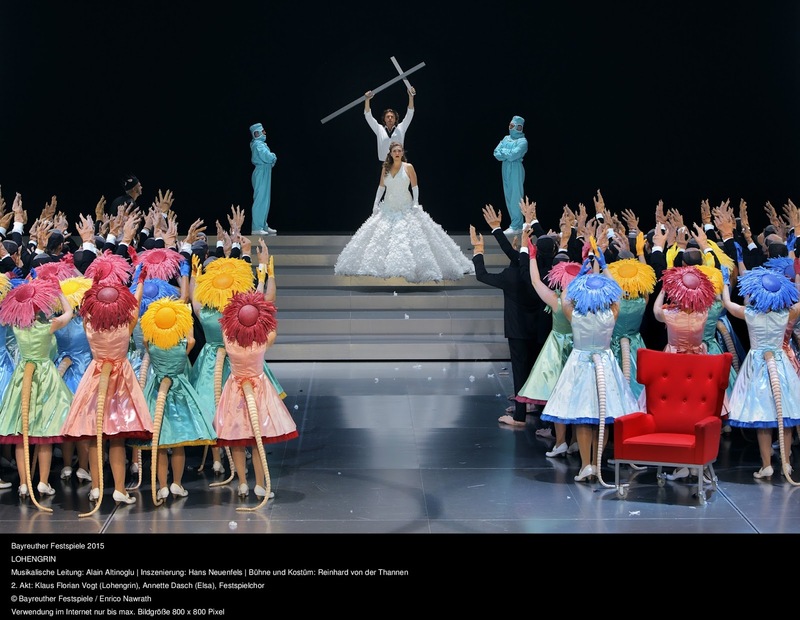 Much has already been written about this production, which is said to be in its last run here at the Festspielhaus and has already been available on DVD for some time. (It premiered in 2010.) I’m not sure if I will have anything new to say about it, but I was glad I got to see it live. The production begins with ordinary-looking Lohengrin in shirtsleeves slowly pushing a massive wall upstage, finally leaving through an elevator-like door at its center. Then we switch to the other side of the wall: the antiseptic realm of huge lab rats who scuttle around on their back feet, numbers on their backs and thick tails flapping. It’s funny and strangely endearing, but also a convincing take on the unthinking, obedient, excitable community of the Lohengrin chorus. Silent workers in blue hazmat suits occasionally move things around. Only the main characters are human: nervy, hipster-looking Heinrich, bureaucrat Telramund, suited Ortrud, and elegant Elsa. It’s a simple but rigorous concept, one which leaves open as much as it answers. Who is in charge of this laboratory? What is the experiment? Neuenfels preserves the opera’s mythic, mysterious quality while giving it a sharp, insightful, and contemporary framing. When Elsa searches for a savior, the house lights come up as she looks out into the auditorium, indicating that it’s going to be someone from the Outside (something of a radical act in Bayreuth!). By opening with Lohengrin, Neuenfels seems to imply that it is he who is being examined, and he who is entering from an external world. He tests the rats’ faith, making the sign of the cross at one point, but they ultimately let him down. 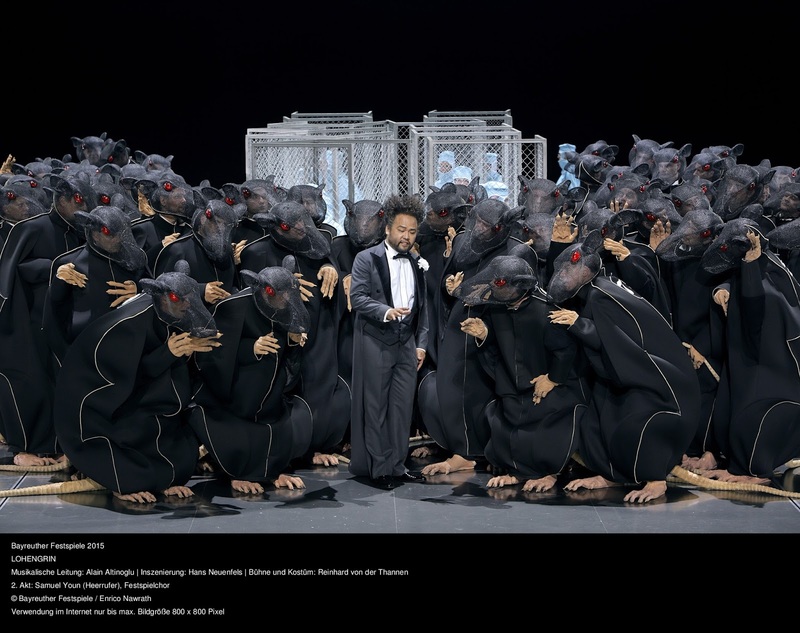 The rats occasionally show human capacities, shedding their ratty shapes and heads for human form midway through both Acts 1 and 2 (when Lohengrin is in power). But Lohengrin and the rats fail, and he leaves them with a creepy new overlord in an oversized newborn Gottfried, an ending which seems like a sick version of 2001: A Space Odyssey. It’s a production which adroitly balances creepy (rats, that Gottfried), cute (baby pink rats!) and camp (uh, rats). It’s amusing, but the trick is that the ratty business is confined primarily to the chorus. The chorus of Lohengrin sings a lot, arguably far more than they need to according to the requirements of the plot. The staging gives them and their music a structurally important role, letting them do the conceptual heavy lifting while the principals work in a far more conventional style. I think this is why the production has become so popular: it gives us an interesting idea but also does the big dramatic scenes in a straightforward, human, sympathetic way. They relate to the concept but the more drastic elements of it recede to the background. The mix of styles also helps keep this long opera interesting–it doesn’t drag at all. The second act is perhaps the strangest. It starts with Ortrud and Telramund marooned out of town in an apparent highway robbery, their old-fashioned carriage listing and their horse dead. This is an image which has no obvious relation to the central laboratory idea–but does reflect the characters’ predicament, thrown out of town and out of their expected powerful perch. The Ortrud-Elsa scene unfolds on a rather human scale. But then they don dueling white and black feathered dresses for the wedding scene (where the chorus has emerged in festive wedding outfits, though the women still have rat tails and the men keep their rat feet) and engage in a sort of Swan Lake showdown. It’s camp–particularly with Petra Lang’s over-the-top evil Ortrud, one of the most camp-prone roles out there–but in a recognizably, even clichéd, operatic fashion. The third act also leaves the rats behind for a tense, detailed staging of Lohengrin and Elsa’s showdown, greatly enhanced by the acting skills of Vogt and Annette Dasch. 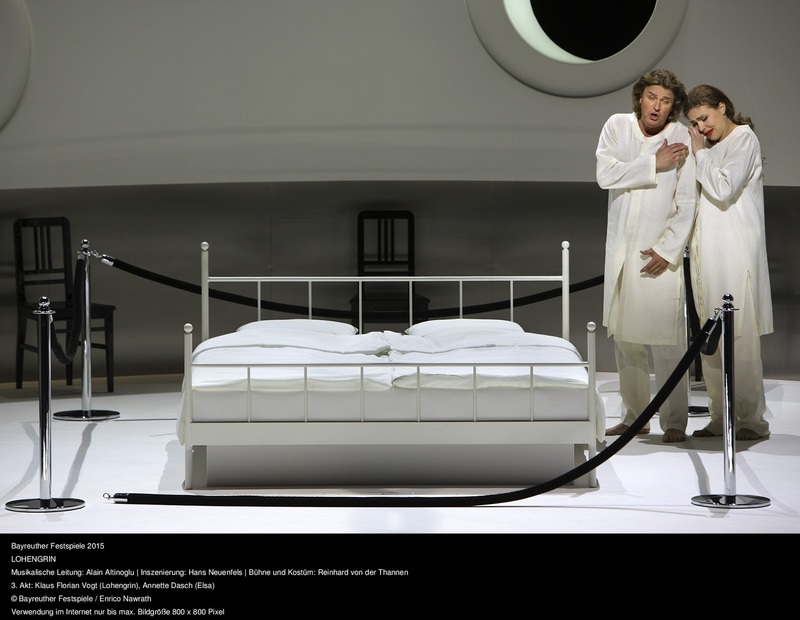 Lohengrin is unusually devastated by Elsa’s questioning–it seems here that it is not only her failing but also his. Telramund’s reentry is his first appearance as a rat (by the way, I don’t think “rat” has the same idiomatic meaning in German as it does in English, but it would be apt if it did), and Lohengrin leaves the rats in their ratty state, in the hands of evil baby Gottfried. Elsa changes from wearing all white to all black–Ortrud’s color. It’s a unique and rich staging. Just a few more things: The rats rebel on occasion, resisting the lab workers’ intervention (two rats argue, defeat the two lab workers who try to subdue them, and give each other a weirdly funny high five). Heinrich’s status is perennially unclear, and remains so, he and Telramund illustrating their arguments with whimsical line-drawn animations on video. It doesn’t propose solutions but rather suggests themes: evolution, religion, community, and it does so in a strikingly original way. Annette Dasch was much improved from her December Evas at the Met. While it’s clear that she’s working with a compromised voice, she has forced it together with technique, and sometimes produced a very nice, dark sound. At softer dynamics things can turn thin and sour, such as the ending of “Euch Lüften,” but her Act 3 was strong. She also has great stage presence and a real gift for making these flat, suffering maiden characters seem steadfast and real. In comparison, Petra Lang is 100% diva, as Ortrud producing big, too big singing which was usually but not always on pitch. Nuance and sensitivity do not seem to be in her repertoire, but she is what big nasty Ortruds are made of. As Telramund, Jukka Rasilainen had moments of gruff Bayreuth Bark but mostly produced a solid, snarling sound and stalked around the stage looking menacing. As Heinrich and the Heerrufer respectively, Wilhelm Schwinghammer and Simon Youn were both impressive–good thing, because I’m hearing Youn as the Dutchman on Friday. For all its radical guise, I think this production has succeeded due to its willingness to be inconsistent, not only to leave many questions unanswered but to move in and out of its own frame. It’s a funny thing: austere but somehow warm, rigorous but flexible. Perhaps its popularity isn’t so surprising after all. Was just watching the dvd the other day. Glad to see that has become so popular, it really is a brilliant production. I love that it leaves things unanswered. For once that comes off as fascinating rather than irritating and lazy. Voigt is pretty stellar to and this is probably the one role that works perfectly for him. 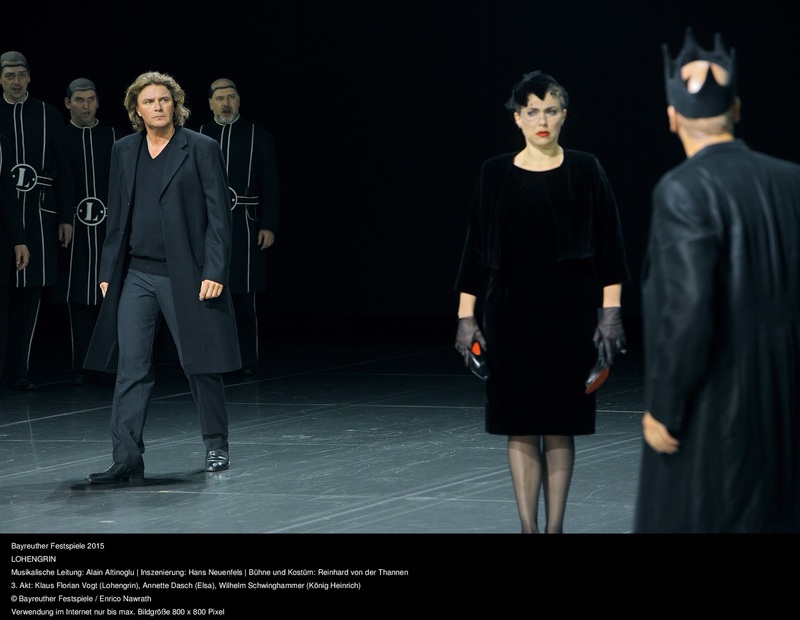 Hard to believe it was Kaufmann that was in the premiere (with Herlitzius as Ortrud). Shameful confession: I'm actually a pretty big Dasch fan. Yes it's a workday instrument but she knows what she can do with it. And I think she's just fascinating in a Schwanewilms and poplavskaya-esque way in that what she's doing is really "acting" a la Mattila or Meier, but she seems so focused and concentrated that I'm always watching her. I can understand Dasch fandom! I don't think she's as intense as Poplovskaya, but she's *present* in roles which are usually done as passive do-gooders. I'm a huge fan of this production too. The rattiness brilliantly undermines the whole "lets march off and subdue the Eastern untermenschen" problem. Also Annette Dasch. Love her to bits.